If you plan to switch from Android to iOS, you may want to transfer Android Kik messages to the iPhone. Backuptrans Android Kik to iPhone Transfer for Mac is the best tool to help you transfer Android Kik messages with attachments to iPhone directly on Mac. All your Kik chat messages will be migrated and merged perfectly on your iPhone. Convenient and safe. 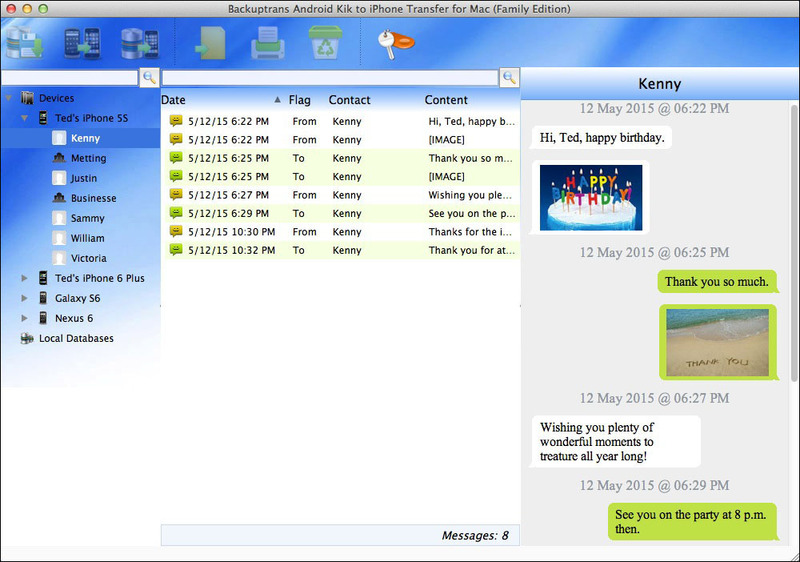 Powerful Mac Android to iPhone Kik Messages Transferring Software. Got important Kik chat messages on your Android and want to transfer them to an iPhone when you switch phone from Android to iOS? Now Backuptrans Android Kik to iPhone Transfer for Mac must be the the best software for transferring Kik messages from Android to iPhone. All Kik messages will be merged perfectly onto your iPhone. No other transferring utility software can do this. Backuptrans Android Kik to iPhone Transfer for Mac is designed to transfer Kik Messages from Android to iPhone in a direct way on Mac. Connect both your Android phone and iPhone to Mac computer, and you will get it done in a few seconds. Users can choose to either transfer all Kik messages to iPhone or just transfer conversation with a certain friend as they want. Besides, you can also save Kik messages from Android to a readable local database on Mac for backup. Once you backup your Android Kik messages onto Mac, you can use the software to copy those messages from local database to your iPhone anytime you want. Viewing, exporting or printing out Android Kik Messages on Mac are supported, too. Users can export and save Android Kik messages as a file onto Mac with a few clicks even though it came across a broken screen. File format includes TXT, CSV, Word, HTML and PDF. Cleverly, Backuptrans Android Kik to iPhone Transfer for Mac also lets users print out Kik messages from Android in threading conversations. You are flexible to choose to export/print all messages or only the Chats with a certain friend. More than 3,000s of satisfied users. Easy to use software and no technical knowledge required. Supports iOS 12 and iPhone XS/iPhone XS Max/iPhone XR. Backuptrans Android Kik to iPhone Transfer for Mac lets you transfer Kik Message with attachments from Android to iPhone directly on Mac. All these Kik Messages will be merged perfectly on iPhone. All data you transfer is 100% the same as the original. Use innovative synchronization algorithms to help Android users easily save Kik Messages including attachments from Android to Mac. Even Android with a broken screen supported also. With its powerful feature, Backuptrans Android Kik to iPhone Transfer for Mac can also copy Kik chat history from database on Mac to iPhone. Moving Kik messages attachments to iPhone is also supported. Fast transfer speed and five common file types supported, including txt, csv, doc, html and pdf. You can choose one according to your needs. Additionally, you can also choose to transfer & export all Kik chats messages out or just export the chats with a certain contact. Print out Android Kik Messages in a few mouse clicks. Perfectly print out your Android Kik chat messages in threading mode. Reading the printing output feels like the same as that on your Android. Again, you can also choose to print out all Kik message history out or just print the chats with a certain contact. Supports 1,000+ Phones including iPhone 7 Plus/7/6S Plus/6S/6 Plus/6/5S/5C/4S/4/3GS, Samsung, HTC, MOTOROLA, Sony Ericsson, LG, HUAWEI and More. Transferring Kik data from Android to iPhone on different networks(AT&T, Verizon, Sprint, T-Mobile etc) is also supported. Very easy to use, suitable for both beginners or advanced users. 100% clean. Easy and safe to install and uninstall. Life-time free updates and fast customer support. Operating system - Mac OS X v10.7 - 10.14 macOS Sierra. Processor - 64bit kernel processor. Available HD space - 50MB free hard disk space or more for installation; RAM - 512MB RAM or more. iTunes 10.0 or above is required. iPhone running iOS 4 or above is required. Support iOS 6, iTunes 10.7 or above is required. Support iOS 7, iTunes 11.0 or above is required. Support iOS 8, iTunes 12.0 or above is required. Support iOS 9, iTunes 12.1 or above is required. Support iOS 10, iTunes 12.4 or above is required. Printer must be connected to the computer for printing. Personal Edition lets you manage Kik chat history for up to 3 different Devices for the price of one. Only download and install on your own personal Mac computer. Family Edition lets you download and install on all Mac computers of your family and manage Kik chat history for up to 8 different Devices in your family for the price of one. A specially priced, benefit-rich bundle created for business professionals. It is a one-year license that lets you download and install on all your company's Mac computers and manage Kik chat history for unlimited Devices for the price of one. How to Transfer Kik Message History from Android to iPhone?